The Roxy Regional Theatre is currently running their version of the enchanting Engelbert Humperdinck opera Hansel and Gretel. Lost siblings come across a sumptuous candy house, occupied by an old woman who has her own reasons for fattening up little children. The show playing December 4 through 19. The musical play was adapted and is directed by John McDonald. 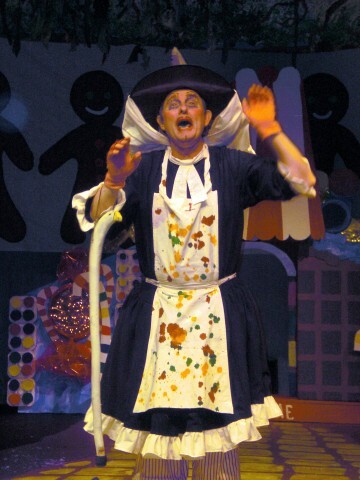 It stars Drew Torkelson as Hansel; Alicia Kelly as Gretel; Brendan Cataldo as the Father; Reischa Feuerbacher as the Mother; and Dr. Thomas King as Rosina Dainty-mouth, the Witch; area children fill the role of the children taken by the Witch to make her gingerbread. I attended the show on Friday evening, and the house was packed. Continue reading for my review of that performance. The show starts off with Hansel and Gretel alone in their home. They were supposed to be doing their chores, Hansel tying brooms for his father to sell, and Gretel mending stockings but instead they were playing around. Hansel gets hungry but all that is in the house is dried out bread. Otherwise the cupboards are empty. 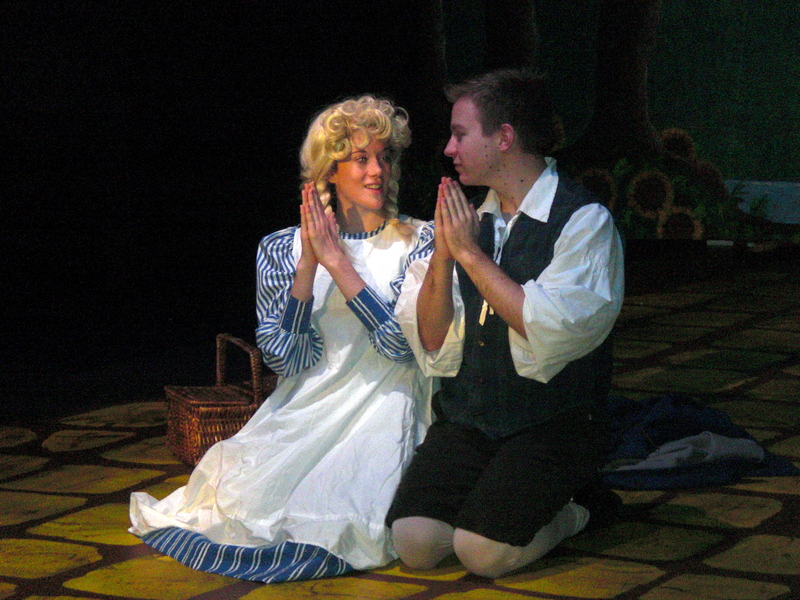 Gretel tells Hansel about a pitcher of heavy cream that a neighbor dropped off for their mother. Day dreaming of bread pudding Hansel keeps stealing tastes as Gretel tries to get him to stop. When their mother came home, the pitcher of heavy cream was knocked over and broken. Their mother sends them off to pick wild strawberries in the forest. Before they left she gave them the dried out bread to take with them. After picking the strawberries Hansel and Gretel become lost in the forest, and are forced to spend the night in a field. As they sleep they received a visitation from a bevy of Angels. Back at home their Father returns with a virtual feast of food, and tells Mother about the good fortune he had that day selling his brooms. He had sold everything he took with him that day. After he asks where the children are, Mother tells him she sent them into the forest. Father knowing the stories of the evil woman who cooks and eats children, worries about his children. Together him and his wife set off into the forest to find Hansel and Gretel. The next morning Hansel and Gretel wake up and discover that the clearing they had stayed the night in holds a wondrous cottage built of sugary sweets of all kinds. The two ravenous children begin to eat, as a voice is heard wonders who is nibbling like mice on her house. The children convince themselves that all they were hearing is the wind, and continue eating. The Witch comes out of her home, and uses her magic walking stick to charm Hansel and Gretel, to keep them from running off. The Witch imprisons Hansel in a cage, and forces Gretel to do her bidding. She feeds Hansel to fatten him up. When the witch is ready, she asks Gretel to check to see if the oven is ready. Gretel plays dumb, and as the witch shows her what to do, she pushes her into the oven. This is a very abbreviated synopsis of this wonderful play. You have to go see it to get the full effect. All of the performers were well cast, but two stood out above and beyond the rest, Dr. Thomas King as the witch, and Brendan Cataldo as the father. In my opinion the Witch steals the show! It may be that they simply have more experience to draw upon, but whatever reason during the time on stage, they dominated it. Dr King is also an amazing opera singer! His costuming was fun, complete with the brilliant green tongue he uses to full effect. Brendan has a wonderful voice and knows how to masterfully project it. This will be Alicia Kelly’s last show at the Roxy for some time, so if you have fallen in love with her during her stint here, be sure you make time to go see this show! She is heading off to New York, to audition on Broadway. While Broadway producers most likely think very little of what a theatre critic from a small town like Clarksville, TN thinks, when casting, they would do well to take a very close look at this extremely talented young woman. The music was quite well done and looking at the bio of the performer playing the piano I can see why. 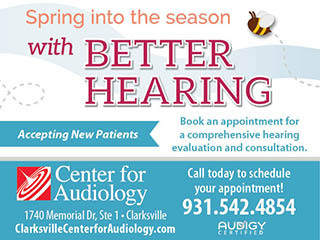 Dr Vicki King is an Assistant Professor of Piano at Tennessee State University. The sets as with all Roxy shows help the audience immerse themselves into the actors’ performance. The Gingerbread house just has to be seen! All in all I can heartily recommend this show to anyone and everyone. It doesn’t matter if you are young or old, this production will charm and enchant you! Do yourself a favor and get tickets to go see it! 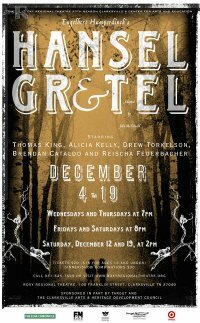 Hansel and Gretel plays Wednesdays and Thursdays at 7pm and Fridays and Saturdays at 8pm, with 2pm matinees on Saturday, December 12 and 19. Tickets are $20 (adults) and $15 (ages 13 and under) and can be purchased online at www.roxyregionaltheatre.org, by phone at (931)645-7699, or at the theatre during regular box office hours (9am-2pm, weekdays). Dinner/show combinations are also available for selected Saturday evening performances. To learn more about what is going on at the Roxy Regional Theatre, listen to Roxy Radio Tuesday – Friday at 1:30 PM on WJZM 1400 AM.